Rub the butter into the flour until the mixture resembles fine breadcrumbs. Add enough water to make a firm dough. Wrap the pastry in cling film and let it rest in the refrigerator while you prepare the apples. Roll out the pastry between two sheets of baking parchment. Using a knife, cut a circle to fit the tart tin, and line the tart tin with the shortcrust. 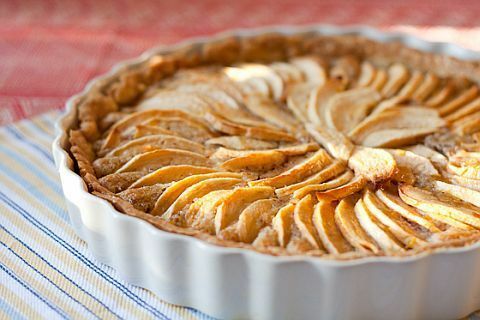 Place the apple slices into the pastry case in an overlapping spiral beginning at the outer edge and ending in the centre. Sprinkle with the caster sugar. Bake in the preheated oven until the pastry is golden and the apples are soft, about 30 minutes.